The Collared Sparrowhawk (Accipiter cirrocephalus) is a small and slender bird of prey that is widespread through Australia and New Guinea except for sandy deserts. It inhabits forests and woodlands. The body length is 30–40 cm (11.8–15.7 in) and the wingspan is 55–80 cm (21.7–31.5 in). Females, which weigh 240 g (8 oz) as adults, are noticeably larger than males, which weigh 125 g (4 oz). The upper plumage is grey with a chestnut collar; the underparts are mainly rufous, finely barred with white. 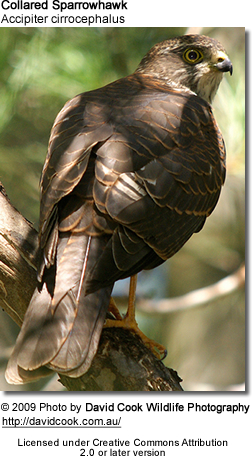 It is similar to the Brown Goshawk but smaller. It feeds mainly on small birds caught in flight; occasionally insects. It nests in trees on a platform of sticks and twigs. The clutch size is usually 3 or 4. The incubation period is about 35 days, with chicks fledging about 24–33 days after hatching.